Log in or Register for options to receive email notices when new products from American Crafts arrive. Like letter and number stickers? You’ve come to the right place! 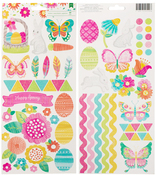 American Crafts stickers offers a great selection of thick foam stickers, die-cut stickers, and felt stickers. You can use these letters and numbers for your scrapbooking albums, cards, or other crafts!